With eight of the world’s ten highest peaks, Nepal is loaded with spectacular mountains vistas. The Everest trek is justifiably famous, not only for its proximity to the world's highest mountain but also for its friendly Sherpa people, picturesque villages, great variety of cultures and traditions, Start festivals and monasteries. The Sagarmatha National Park is rich with flora and fauna, but the existence of the yeti remains a mystery. You will be met on arrival and transferred to your hotel, the Vaishali, or similar. Evening pre-trek briefing. Half day excursion touring Kathmandu (private bus) with its many temples and pagodas. In the afternoon your trek packs will be issued and other pre-trek arrangements are dealt with. Rest of the day free in Kathmandu. The trail climbs for about an hour after Puiyan to a ridge at 2800 metres, then up to another ridge, passing the path to Lukla airport, after which we climb on to Phakding. Meet others in the group those who have started from Jiri. The trail continues north up the Dudh Koshi valley to Jorsale, where the trail officially enters the Sagarmatha National Park. There is an entrance station just beyond the village where trekking permits are checked and National Park fees collected. We continue along the trail, cross the Bhote Koshi River and climb steeply to Namche Bazaar 3500 m. Remember to look out for glimpses of Mt.Everest early on the trail. We have a rest day in Namche Bazaar to acclimatise. This town, the hub of Sherpa society, is the administrative centre of the Khumbu region and has a police checkpost (we must all register there), the headquarters of the Sagarmatha National Park, a bank, several shops selling items of every description and a proliferation of Sherpa inns. Perhaps one of the most fascinating days of the trek, we travel to the village of Thame (12,464'). We spend the evening visiting the home and dining with the family of Lhakpa Rita Sherpa, our Sirdar (lead Sherpa). His family has been a mainstay of this small community, raising yaks and farming. This gives us an intimate view of Sherpa culture while visiting a traditional home. Interestingly enough a number of famous climbing Sherpas have come from Thame. The 'Thame' experience is one rarely afforded to trekkers. Waking early we climb to the Thame monastery and further explore local Buddhism. We tour this 400-year-old gompa and learn about its inner workings and the lives of its monks. As we tour the monastery we discuss the wall paintings and artifacts that are central to Buddhist practice. Before departure we will hopefully have the opportunity to meet and receive a blessing from the Thame Rinpoche (head priest). We return the same way close top namche and we climb to Syangboche, then trek to two serene Sherpa villages, Khumjung and Khunde 3890 m where Sir Edmund Hillary established his first hospital and Khumjung 3790 m where he established a school, both in the early sixties. The Khumjung Gompa posseses what is supposed to be a Yeti skull? Leaving the main trail to Mt. Everest, we climb high on a ridge to 4000m past a large chorten at the village of Mong, said to be the birthplace of the saint Lama Sange Dorje, the reincarnate lama of Rongbuk Monastory in Tibet who introduced Buddhism to Khumbu. From there we descend to the village of Phortse Tenga by the Dudh Koshi (river). From Phortse the trai climbs steeply through forests of rhododendrons and then stands of juniper and large conifers as the altitude increases. We pass through Sherpa kharkas (high pasture summer settlements used by Sherpas to graze their herds of yaks allowing their lower winter pastures to recover) and the villages of Tongba 3950m and Gyele 3960m to Dole. We have great views of Khumbila and Tawachee peaks throughout the day. Today we have a short and fairly leisurely trek to allow us to acclimatize to the altitude. In the morning we have a steep but beautiful climb through conifer and rhododendron forests and stands of juniper to Lhabarma 4220m and Luza 4360m. There are kharkas wherever there is a flat spot and the slightest hint of water. We continue to climb along the side of the valley, high above the river to the camp at Machhermo 4410 m. It was here in 1974 that a yeti supposedly killed three yaks and attacked a Sherpa woman. So watch out for Yeti in this area. This is your first real day at high altitude and the trekking today may be described as moderate to difficult. However, the going is slow (in fact, it is recommended that you walk slowly to avoid exhausting yourself). We climb a ridge from where the valley opens wide as the trail passes through Pangkha. Mt. Cho Oyu 8153 m dominates the skyline to the north as we climb the moraine on the left flank of the Ngozumpa Glacier. The climb is steep to the first of the four lakes that lie in the Gokyo area but the trail levels off towards the second lake, Longponga at 4690m. We finally ascend a path past the largest of the lakes Dudh Pokhari to Gokyo at 4750m. Gokyo is a typical kharka stone houses and stone walled pastures. A free day to explore the area around Gokyo or rest. For enthusiasts a rigorous hike up Gokyo Ri 5360m, the small peak above camp provides spectacular views of the Everest trinity, Nuptse 7879m, Lhotse 8511m, and Everest 8848m, as well as Makalu 8463m looming to the east, Cho Oyu 8153m to the north and the smaller but closer peaks of Cholatse and Tawachee to the south. There is a wonderful view of Gokyo and Dudh Pokhari spread out below us. The next day we will explore further up the valley Of the Ngozumpa Glacier and visit two glacial lakes. The really fit can climb to the top of nameless peak 5800m overlooking the two lakes. A short and easy day. We cross the southern end of the Ngozumpa Glacier to the stone huts of Thagna Kharka. Today is long, steep and challenging but non-technical climb over rock, snow and perhaps ice to Chola La (pass) 5330m which links the glacial valleys of Cho Oyu and Everest and from where we have superb views. We descend from the pass, cross a small glacier, negotiate the ice fall at the end of it and descend via Leisyasa to Dzonglha Kharka 4830 m, a high altitude summer pasture directly beneath the north wall of Cholatse Peak 6440 m.
After a morning of rest, we hike on a trail above Tsholo Lake and join the main Everest trail at Dughla on the terminal moraine of the Khumbu Glacier. From Dughla we climb up the moraine past a row of stone monuments in memory of Sherpas who died on expeditions to Everest and on to our camp at Lobuche 4930m. We make an early morning start and ascend the trail along boulder fields and glacial debris to the edge of the Khumbu Glacier then continue up to Gorak Shep (5160 m.), nestled below the coned summit of Mt. Pumori (7161m.) and the sheer west face of Nuptse. From there we make a steep ascent to the top of a small peak, Kala Patthar 5545m meaning "black rock". From here the views is magnificent enough to make us forget the difficulty of the climb. Everest , Nuptse, Ama Dablan, Kantega, Tamserku, Tawatse and Pumo Ri all present themselves in a 360 degree panorama. Spare Day Or Excurssion to Everest Base Camp if there are any climbers just return from Everest expedition: Spare day for rest and recreation or excursions or washing or whatever. It may be used as a catch up day if we are running behind time, things don't always turn out as planned in the Himalayas. Return trek to Lobuche and a short descend to Thukla and an easy flat trail to and a small descend to Dingboche. 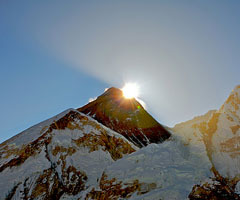 This is the highest big settelement in the Khumbu area of Sherpas. We descend the valley of the Imja Khola, trek through the village of Dingboche with its stone walled potatoe fields, down alpine pastures through the kharkas of Tsura, Orsho and Shomare to the village of Pangboche, the highest year round settlement in the valley. The Pangboche Gompa (monastory) is the oldest in the Khumbu and once used to boast the skull and hand of a Yeti, (stolen in 1991) Leaving Pangboche the route descends past some magnificently carved mani stones to the Imja Khola which we cross via a steel suspension bridge high above the river at a spot where it rushes through a narrow cleft. From there we have a gentle climb to the tiny village of Debache past mani walls deep in a rhododendron forest. From Debache we have a short steep climb to Thyangboche through a forest of birches conifers and rhododendrons. 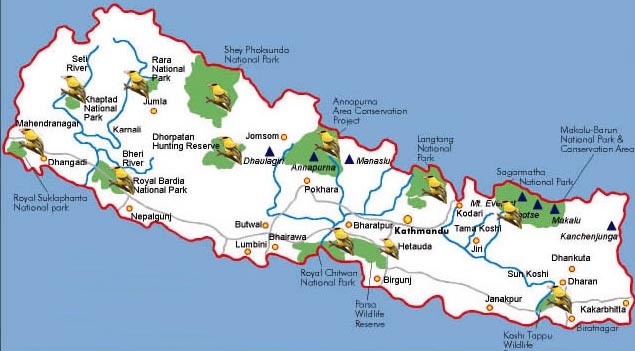 Because of the ban on hunting at Thyangboche there is much wildlife in this area. we may see almost tame blood pheasants, Napal's national bird the Himalayan monal or ipeyan pheasnt, snow pigeons and red billed choughs (they will pinch any food you leave lying around ). A visit to the monastery is a must. The singular beauty of Ama Dablam, standing isolated from all other mountains provides a spectacular backdrop and reminder of the height of Himalayan peaks. From Thyangboche the trail drops sharply down to the Dudh Koshi and the village of Phunki, where we cross the river, and up toward Namche Bazaar, winding high above the river with views north towards Everest, Lhotse and Nuptse. We retrace our trek down along the gorge of the Dudh Koshi to at Lukla to catch our return flight to Kathmandu. Weather permitting our trekking crew might prepare a farewell treat for you. You will be invited and expected to join in the singing and the dancing!! It's great fun !! Fly to Kathmandu. Transfer to Hotel and then free time in Kathmandu.